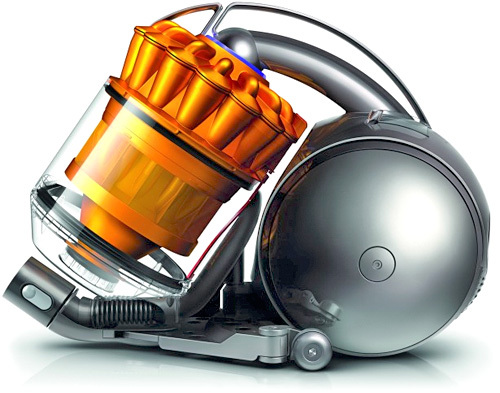 Dyson's Ball Technology Is Now Available In Their Canister Vacuums | OhGizmo! Recently unveiled at IFA, Dyson’s ball technology, which makes their upright vacuum cleaners easier to steer and navigate around your home, will soon be available on their canister vacuums as well. The first model to feature it, the Dyson DC37, uses a central pivot point working in conjunction with an articulated chassis so it’s easier to get around corners, and harder to get stuck. Like with their upright models, a lot of the DC37’s components are actually hidden inside the ball itself, further illustrating that Dyson is still serious about re-inventing every aspect of the vacuum cleaner. In fact, the Dyson DC37 will also come with their Musclehead floor cleaning tool which detects differences in air pressure, automatically raising or lowering a set of brushes as it passes over carpeted or hard floors. Available sometime near the end of October for ~$616 to $770 (€439 to €549).